Buoyancy is the upward force from the water needed to stay afloat. Since pressure increases with depth, there is a higher pressure and the bottom of the volume of fluid than the top. The pressure difference results in a net force that will accelerate an object upward. The magnitude of the force is proportional to the pressure difference and is equal to the weight of the displaced fluid, which is a property explained in Archimedes’ Principle. The first person to realize a concept that related to buoyant forces was Archimedes. Archimedes stated the basic concept of buoyant forces in his famous Archimedes’ Principle, which states that the weight of the fluid that anybody displaces when submerged either partially or fully, is equal to the buoyant force exerted on said body. This buoyant force is what allows any object to float on the surface of any liquid as long as the buoyant force is large enough of counter the weight of the object; otherwise, it will sink. A good example of this principle is a floating aircraft carrier. Although the ship is made out of heavy steel, it is constructed so that there is a large amount of open space in it to stay afloat. In addition, what determines whether the object is heavier than the buoyant force is its density. Density, by definition, is the mass of the object per unit volume that the object takes up and is denoted by the Greek letter ρ (rho). Since the buoyant force is equal to the weight of the water displaced by the object, if the submerged object is denser than the water, it will sink because it has a greater weight than the water displaced. In this experiment, we test this theory buy using a common orange. One can think of the peel of an orange like a life jacket that might keep you afloat while in the river. The density indicates how close the atoms of the object are packed together. 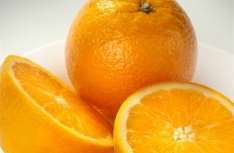 In the case of an orange, the atoms of the peel are not packed near as closely as the actual fruit, causing it to float when the unpeeled orange is placed in the water. This project involves two oranges, weighing approximately 0.49 pounds each. When dropped in water, it can be observed that both oranges float when they are unpeeled. In an orange, the peel is a spongy material and has tiny pockets of air, which makes the density of orange less than the density of the water, in turn, causing it to float. When the second orange is peeled and dropped in water, it sinks to the bottom of the container. This simple experiment is a great way to demonstrate buoyancy and density. The orange is enclosed in a porous rind, which has a spongy look and feel and contains air pockets, which help to provide buoyancy to the floating orange. When the unpeeled orange is put into the water then the air pockets of the rind fill themselves with air, the submerged orange is activated as a life jacket, the orange is saved from drowning into the water, and it floats on the surface. The similar concept is used in the life jackets, which help the humans to stay afloat in the waters. All the people riding on the boats or travelling in the sea are educated and advised to have a Personal Floating Device (PFD) with them so that in case of emergencies they can be save d from any kind of mishap. It is very interesting to note here that most of the deaths that occur on the waters are not far away from the shore but they occur quite near the shore, on the inland waters within a radius of about a 50 m from the shore due to the sheer negligence of the swimmers because of their insistence on not wearing a life jacket. The thing to note here is that the efficiency and the coverage of the state on the waters is so amazing that the state does not allow any passenger on the waters to stay on board without a life jacket. There is an exemption to the passengers if they are staying in the cabin or any other closed place on a boat. The state offers a guidebook for the travelers and the passengers on the waters and it clearly states and advises the presence and wearing life jackets so no loss of any kind or any other harm can take place. So, what is in a life jacket that it has become a serious part of any passenger’s life that commences his trip on the waters? The life jacket provides the extra buoyancy needed for the person to stay afloat and save himself from drowning. The life jacket is filled with air on the inner side, which helps to control the relationship b/w the buoyant force and that of the person floating. It helps to carry the weight of the person floating above the water so that his or her weight does not become a serious concern and drowns the person. Gone are the times when one would have to wear inflated life jackets that were also heavy and bulky and were also a problem for the person to wear and be comfortable with it, with each passing day the scientists are very much concerned about the welfare and well-being of the people so they are developing new up to the mark jackets that are easy to wear, inflate themselves in water, are very comfortable with huge arm outlets to ease the movement in the waters. Nowadays one has to ensure the presence of different personal floating devices for different purposes i.e. for inland water use, for staying on board, for float purposes. The life jacket is not a fit for all object, it is to be chosen for people of different ages and sizes. It provides inflation according to the buoyant force needed for the person to stay afloat. One of the biggest advantages of having a life jacket is that it comes in shiny colors that are visible for the rescue staff and it is easier for them to save the drowning or in danger person. On board staff are advised to have some floating aid for the people drowning in the waters so that they can provide support to them in the hour of need and can save a human life with the instant aid. The state ensures that all the people must have some sort of floating aid and for that, the lifeguards as well as the coast guards are advised to ensure the usage of the life jackets and their presence on the boat. Caring about the life jacket is a very important part. The life jacket that is not in a good shape and is torn or have some cuts on it can be of great danger to the user as it can cause the drowning so the life jacket must be properly checked and it should be ensured that they work properly before someone takes a dive into the waters. The safety of the person depends a lot on the reliability of the device that is being employed to save the person from drowning. The basic thing needed for the proper use of the life jackets and their importance in saving the lives of many is conveying the proper education and information to the people on board and to those venturing the waters for any reason whatsoever. The lifeguards and the coast guards should give proper lessons to all the people around the waters. They should arrange a session for all the people that are new to the waters so that their lives can be saved by just a simple precaution of wearing a life jacket. It is easier to save so many just by educating them because every life matters. It can be summarized as the buoyant force generated in case of an orange residing on the surface of the water is basically given by the rind of the fruit which has air pockets and when the fruit is submerged into the water then air pockets are full and the necessary buoyant force is applicable to the weight of the orange and it stays afloat. Life jackets are a useful part of the people travelling on shore and it has to stay with them in the hour of need so that they can save themselves from any difficulty on staying above water or any other danger of drowning. There should be education concerning the proper use of the personal assistance device which helps is saving lives. In addition, the people associated with the business should be given proper instruction to ensure the use of the device. "Buoyancy of an Orange: Analysis." UKEssays.com. 11 2018. All Answers Ltd. 04 2019 <https://www.ukessays.com/essays/physics/buoyancy-orange-analysis-1205.php?vref=1>. "Buoyancy of an Orange: Analysis." All Answers Ltd. ukessays.com, November 2018. Web. 20 April 2019. <https://www.ukessays.com/essays/physics/buoyancy-orange-analysis-1205.php?vref=1>. UKEssays. November 2018. Buoyancy of an Orange: Analysis. [online]. Available from: https://www.ukessays.com/essays/physics/buoyancy-orange-analysis-1205.php?vref=1 [Accessed 20 April 2019]. UKEssays. Buoyancy of an Orange: Analysis [Internet]. November 2018. [Accessed 20 April 2019]; Available from: https://www.ukessays.com/essays/physics/buoyancy-orange-analysis-1205.php?vref=1.